A former triad fresh from a prison term, decides to go straight, but finds himself up against a rival gangster. For a crime thriller, then "Slim Till Dead" (aka "Shou shen") wasn't particularly impressive, and it was often hanging just above the mediocre waterline. Directors Marco Mak and Jing Wong set out with a potential interesting story, especially since there compulsive obsession with weight loss and weighing next to nothing is rampart amongst the women of Hong Kong - trust me, as I have lived there. However, the story just failed to rise to the occasion, and only managed to muster a mediocre result. Which was a shame, because "Slim Till Dead" did have potential for much more. It was the synopsis of the movie and the fact that Anthony Chau-Sang Wong stars in the movie which lured me in. But sadly this movie didn't impress. It should be said that he wasn't really performing up to his usual standards in this movie. What hindered the movie was the lack of anything really interesting or appealing ever really happened. And as such, then the movie just trotted along at a very mediocre pace. And even when the odd bits and pieces of anything that could be interesting, then what was put on the table just never managed to take hold. 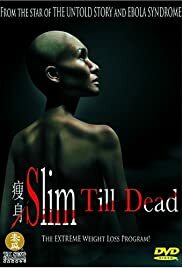 "Slim Till Dead" does deal with some interesting topic, but just a shame that directors Marco Mak and Jing Wong didn't delve deeper into this social stigma, because that this is a multi-million business in Hong Kong which is rotten to the core, and fueled by the media's ability to bombard the people with unrealistic ideals for their bodies. All in all, then "Slim Till Dead" is not a noteworthy movie to have made it out of the Hong Kong cinema. It is mediocre at best, and there are far better crime thrillers available. "Slim Till Dead" scores a very mediocre five out of ten stars from me.